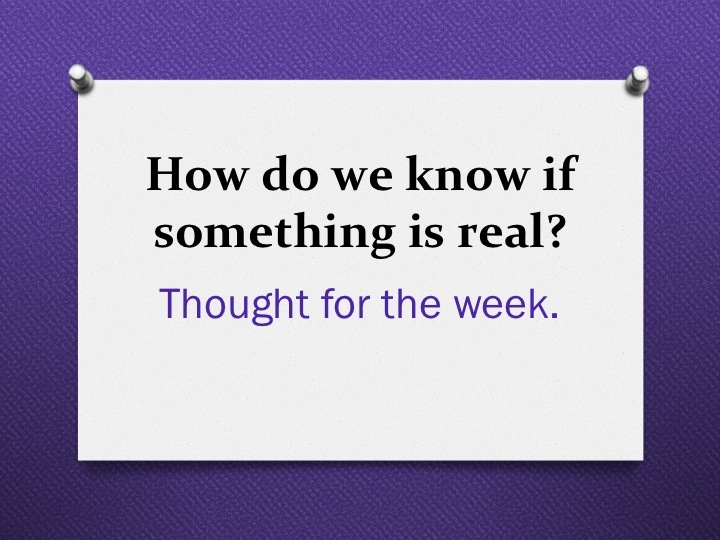 Thought for the week: How do we know if something is real? Next Post Thought for the week: What if chickens laid golden eggs? We know that if something is real you can see it but you need to take a closer look. If you no that some thing is real like a carpet is real but it does not have eyes it does not have a mouth or anything it does not have ears it is just real. You can know if something is real if you can feel it and you can smell it and you can taste and see it. Because if something is real you can do it . You know when something is real when you see it feel it,hear it. We no if they are real if you look closer. I think we would know if something is real because it has to have all the seances. Look in there eyes to know that them. I disagree because everything you see I sent real in england things that kids play with are not real. I disagree because everything you see isn’t real in england things that kids play with are not real. I know that something is real if it breathes. If it breathes it would be like a human and humans are real, aren’t they?